Since yesterday morning we saw Tokyo thru a tourists eye. Our first walk took us to the Emperors Garden or rather park; right in front of our noses. If we look out of the hotel room window his residence is right there. Calm and quiet, clean and very pleasant walk we had. Then it was time to find a place for breakfast. Most of the high-rise office buildings are connected with an underground shopping / Restaurant area, wonderful and bright, clean and again, everything is there. ALWAYS a STYLED Seven/Eleven with virtually everything on offer including cold and warm meals, for which microwave ovens are on stand-by, refrigerated white wine as well as red wine, medicines, white dress shirts, fresh fruit & veggies, everything else one might need.... One will also find many restaurants, cafes, shoe-shines, Drug-stores, shops, the lot... We looked around the JP Building and the Nikkei Building, exploring the area. We also explored the Metro/ Underground, the JR Lines (Japanese Railway) network, bought tickets, went there, went here, found the closest station to the hotel and found a Department store where I bought sunglasses to replace my lost pair. Good job, we know our way around, sort of...at least we know how to get from one side of town to the other if we need to. We also know how to get to the station, buy our train / bus ticket for our way back to the airport in Nagoya on Saturday. In the evening we completed our celebration we started two days ago with...SUSHI...during the day we found a small restaurant 8 Min walk from here, thats where we went. We had a bottle of wine, mostly Ngiri sushi, which is not my favourite but it was good. 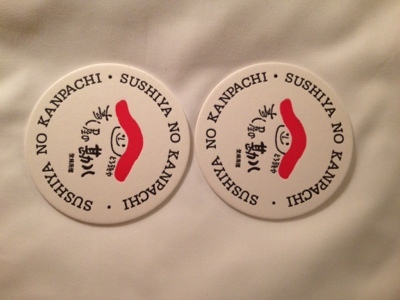 First time we had a raw prawn...all good and we even received a Souvenir in form of two coasters. Today we are planning to go to a Market, to Electric Town and of course looking forward to observing people and we want to go to the Museum of communication. The toilets are something else, it took me 5 minutes to figure out how to flush....the toilets are sophisticated. Lots of functions, Bidet, deodorizer, what did they say on one? for the convenience of the posterior.....heated seats, light normal flush, light normal spray, what a toilet. Our hotel is just something else, we most certainly have never stayed in a more perfect lodging before. In celebration of us crossing the Atlantic and Pacific oceans Pilot & Flugzeug invited us for a typical japanese dinner in a Restaurant nearby. Very special indeed. We chose to depart Tokyo one day earlier than planned to reduce the required travel time to Naha, our next destination. We are busy doing our flight preparations for the next few days. Different challenges will be with us for a couple of weeks, a few long legs under difficult weather conditions, starting tomorrow lasting a few days, with a forecast of a typhoon. Right now, Dietmar is busy, how does that actually influence us and our flying? Es scheint als ob Ihr Euere eigenen Batterien in Tokio wieder aufgeladen habt. Alles Gute für die nächste Etappe.